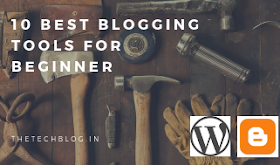 Wondering what are some of the best blogging tools for you to start with your blogging career? Here I have a list curated with just what you need to help grow your blog both in terms of content and traffic. Although some of the items mentioned in this list are paid, still their free versions that are more than capable to solve all your initial problems to start with. Once you start earning then you can move to some more advanced and paid alternatives which offer much more but those are not of concern in this post. AnswerThePublic lets you find the questions that are being asked most by the people. So just head over to the website and enter your niche or the area about which you wanna blog, and this will give you tons of questions each being a post idea on its own. Again something which will help most of you out there, and especially those who are not that good with Photoshop or other advanced editing tools in order to create beautiful images and banners to be used in your blog post. The free version will be more than enough to get what you need. The banner image used above has been also created through Canva itself. Flipboard offers millions of active users out there who can be your potential readers. Get the Flipboard chrome extension and start submitting your blogs on it to publish it to a wide range of people who actually love to read such content. A platform on which you should surely share your work. Although Keywords Everywhere is not 100% accurate, still this free chrome extension widely helps you in getting the keywords you can target to rank on your blogs. There is no way you are going to get your page ranked on Google if you are not using specific keywords that users are searching for. Again and essential for every blogger out there. No matter how careful you, making spelling or grammar mistakes is obviously going to occur. Grammerly's chrome extension solves this problem. Once installed the free version itself tracks the content you types, highlight the spelling and grammar mistakes and even suggest the correct words. You should not start blogging without it. A note-taking app which can be accessed on all platform is a must for every blogger. You don’t know when something strikes in your mind which can turn into a great viral post. Have Google Keep handy and take notes of anything that comes in your mind and never forget any idea. If you have been researching about blogging you know the importance of optimized images on the blog, they are SEO friendly and they significantly lower the load time of website which is a huge factor in deciding the traffic. Optimizilla is a free tool that lets you compress images and use them in your blog. The image quality is not compromised and you have what you need. So there it is, these are my 10 best blogging tools for beginners. Use them in your blogs and you would surely see improvements from day one. Happy Blogging !!!! If you think I missed a worthy contender here, feel free to comment and help the other bloggers out there.